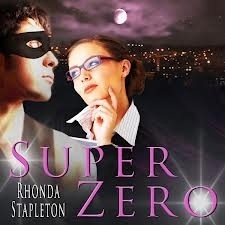 Super Zero by Rhonda Stapleton was one of the most delightful reads I have had in a long time. The story kept me guessing as to who the villain or villains were. Jenna is a mere human being amongst SuperHero’s. Her boss is Mason, aka The Machine one of the SuperHero’s and the head of the League of Heroes. Rowena is his wife, a super heroine. It is the Midwest League of Heroes turn to guard a Crystal that can turn a normal human into a superhero, though one never knows what their new power will be, or it can strip a superhero of their power. Either way, it must be protected. Jenna becomes the guardian of the Crystal when it comes to the LOH. Vigilante is the superhero ordered to protect Jenna from those who would try to steal the crystal. The story has twist and turns that will have you laughing and the biting your fingernails. Ms. Stapleton did a fantastic job on the writing and bringing the characters to life for her readers. I did find some editing problems that took away from the reading for a moment, but it was easy to get back into it once I figured out what the sentences were supposed to be. If you have never read a romantic comedy before, Super Zero is great for cutting your teeth on. Highly recommended. A Dog’s Life by Dale Mayer which was a laugh out loud book. A woman who has never owned a pet starts her first day working as a secretary for a vet. The first day jitters, coupled with a hectic zoo like atmosphere at the vet’s leads Ninna to believe she is losing her mind. You see, Ninna hears voices. Okay, more like just one voice. The voice of a dog, named Mosey. Mosey is a plump canine of the Bassett Hound breed. A bit rotund, a bit snarky, but dog love ’em, he is so much fun. Ninna has spent countless hours and dollars with mental health professionals and pharmaceuticals to stop these voices she has been hearing much of her life. It has been sometime since she last heard the voices and she cannot believe it is happening again. While all of this is happening, we discover that there have been a number of burglaries in Ninna’s neighborhood. What Ninna is unaware of is that this thief has a special interest in her. He’s been watching her through her curtains and is becoming increasingly agitated as he realizes he has changed his routine which has kept him from capture for so long. Stuart is the good looking vet who lives across the street. He brings home animals who need a little extra TLC. This wonderful looking vet needs a dog sitter, and Ninna is trying to decide if she wants a dog or cat and so Stuart offers to allow her to stay at his home to care for the dogs. Nothing can go wrong…right?! Wrong…it does, and in a big way while Ninna is still listening to Mosey as he tells her he wants gravy. More gravy. “What, no gravy?” Sorry, channeling my inner cartoon character. I won’t tell you anymore because I do not want to give the story away. The ending will surprise you, in I think, a good way. This is the third book I have read of Ms. Mayer and I must say, it is my favorite. Dale writes wonderful suspense romance, but this romantic comedy just really has it all. I hope to read more RC’s from Ms. Mayer in the future. She is fast becoming one of my favorite go to authors to read.